In response to my mention of Surf and Sip 802.11b Internet access in a small coffee shop on the last page of my 20th Anniversary Celebration album, I've been trading email with Surf and Sip president, Rick Ehrlinspiel. He's really excited by local 802.11b, and has signed up 70 shops so far, using what sounds like a conservative (as opposed to pre-bubble) financing style. He can do this because 802.11b seems to meet a real need for people and is financially viable for the coffee shops. It is used despite well-known problems (e.g., need to buy additional hardware, security issues, etc.). Many other more-hyped technologies have not yet reached this point (if they ever will). "It was twenty years ago today..." This is the day. The real 20th anniversary of the IBM PC announcement. To get in the mood, you can read my transcript of our staff meeting at Software Arts that day. I've posted an album with pictures from an event last Wednesday night celebrating the 20 years. Enjoy! Read "Celebration of the 20th Anniversary of the IBM PC Announcement". 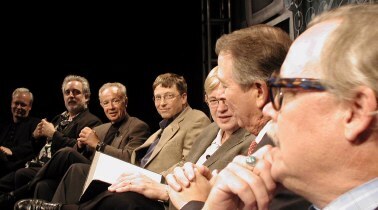 As part of a celebration of the 20th anniversary of the announcement of the IBM PC, Bill Gates and Andy Grove are hosting an event. I'll be attending and will try to file a report afterwards. They have asked many people to attend and contribute thoughts about the past and future of the PC. I've posted some of my thoughts. Read "Thoughts on the 20th Anniversary of the IBM PC". Today is my sister's birthday. Happy Birthday! On August 12, 1981, the day the IBM PC was announced, VisiCalc's developers, Software Arts, held a staff meeting to go over what was happening. Like most of our full staff meetings, it was videotaped with home video equipment so employees that missed it could watch it later. Little did we realize that a segment of this tape would appear as part of PBS's Triumph of the Nerds TV documentary 15 years later. PBS people told me that at the time they put the show together it was the only appropriate video they could find from that day. As part of the many things happening to commemorate the IBM PC anniversary, I've made a transcript of the entire part of the meeting devoted to the IBM PC and posted it on my web site. It includes me reading the press release and other material from IBM. I find it quite interesting to hear what a software developer thought at that moment. It is strange 20 years later to listen to me say, commenting on the fact we were taping it, "This is so that if you miss it, you can hear it again later" followed by laughter implying "Why would we want to?" The lack of attention to the operating system (Microsoft's) and microprocessor (Intel's) in all the material is also quite interesting. Read "IBM PC Announcement 1981". I had a couple of plane rides so I had time to do a report of what I saw and a little of what I heard at the conference. Lots of pictures, with reports about what a few of the speakers said. Read my Internet Summit 2001 Album. Scott McNealy of Sun is a very skilled deliverer of comic lines. He devoted a bit of his talk to knocking IBM, and an enormous amount knocking Microsoft, as reported on CNet (you can also read coverage on the Industry Standard's web site). At the conference: Waiting for new killer apps to get things going again, lots of reality from analysts, numbers, "who knows when things will get better?" As I post this (over 802.11b) Bill Gurley is explaining the 802.11 market and singing its praise. He sees it as a potential threat to 3G cellular. "Dan Benton said this morning that after Napster we need a new killer application. I believe 802.11 is it," he says. I'm attending the Internet Summit 2001 this week, hosted by Bill Gurley and Mary Meeker. Lots of big name speakers, like the heads of Microsoft, Compaq, eBay, Yahoo!, Sun, etc. They have an 802.11b network, so I might be tempted to post instead of listening during the seesions, but I hope to do most of my writing after it's over. We'll see. You can see webcasts of some of the speeches at the Infoworld CTO Forum 2001, including the one on Peer-to-Peer I participated in, by looking at the webcasts page of the Infoworld web site. I never got around to finishing my write-up of Ballmer's talk, but you can watch it there, too.